Beets are delicious and nutritious from root to leaf! Rather than throwing away the beautiful beet stems from your bunches of beets, create a vibrant pickled beet stems side-dish. Filled with nutrients, such as betalain (what gives the beet its beautiful color that leaks onto counters, hands, and cutting boards), beet stems are a powerful source of antioxidants, reducing inflammation and oxidative stress (both linked to heart disease). 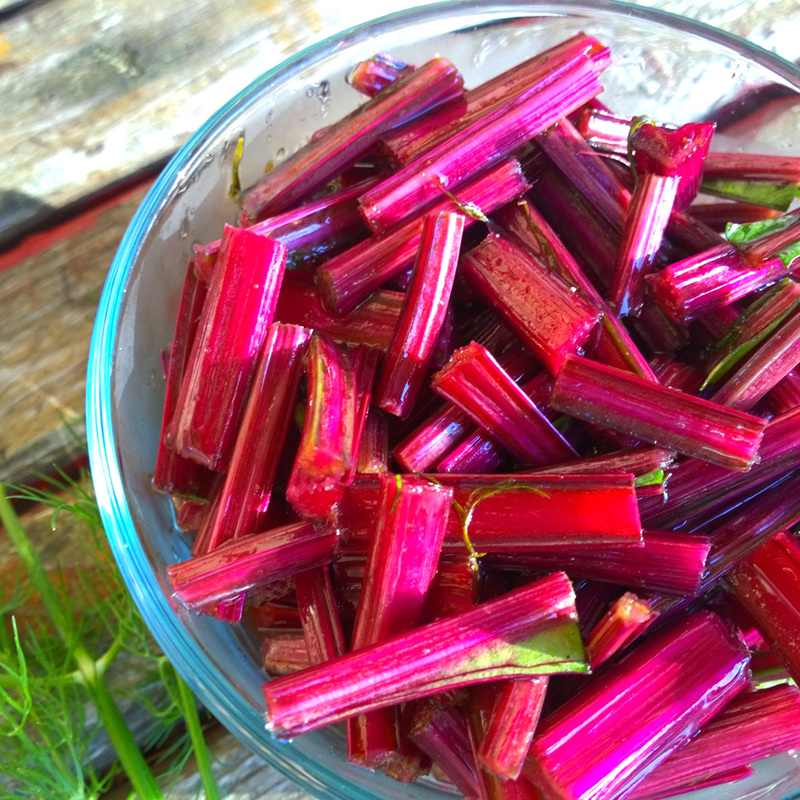 Also high in fiber and minerals, beet stems are nutritious and versatile in recipes. Stems may be blended in smoothies (with a quality blender), juiced with fruits and veggies, sauteed with seasonings, or steamed in soups. When eaten raw, the stems have a satisfyingly refreshing crunch like biting into a cold pickle or crisp celery stick. Although the stems may have a slight bitter flavor for some, the pickling ingredients enhance the stems' unique taste. This is one of the many beet recipes that I love preparing for my grandpa (who is reaching his 100th birthday this month). He is an avid beet eater, who enjoys beetroots and beet greens. Quick-pickled beet stems was a new dish for him to experience, and he loves it. A side of beet stems is the perfect addition to my grandpa's mashed potatoes and roasted chicken (his favorite)! Quick-pickling allows the stems to quickly soak up the flavor of vinegar and herbs without having to can and preserve the stems. You will want to eat this recipe within the day of making. 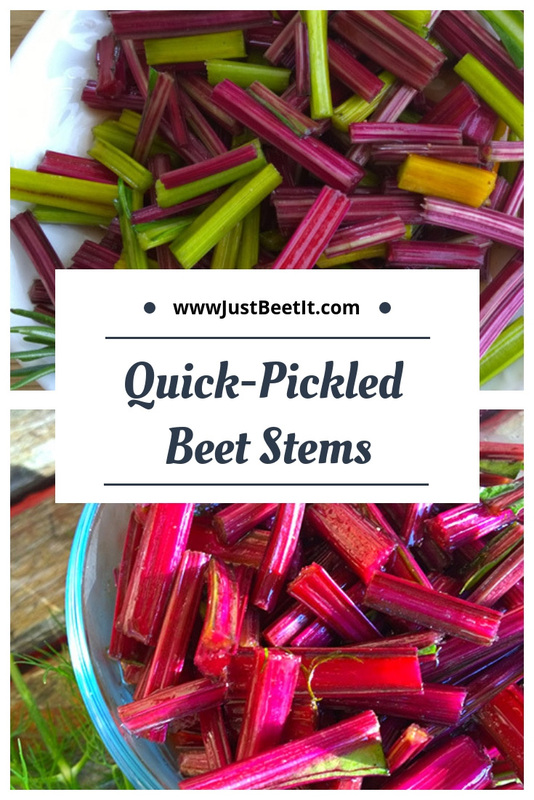 Truly - these stems are so delicious that they won’t last long on the table anyways, but quick-pickled stems work best when they are eaten within a few hours or day of pickling; otherwise, if soaked too long, the stems become tough and chewy. They are still delicious, but since stems are quite fibrous, their texture changes after a day of being soaked in brine. Not sure what to do with beet greens or beets? Stop by "Eating the Beet from Root to Leaf" for more ideas on eliminating food waste and enjoying the amazing beet from its root to its gorgeous leaves. Plus- you can peruse an index of over 20 un"BEET"able recipes. Enjoy! *Stem colors will vary due to diverse beet varieties. 1. Cut stems on the bias into ¼-inch slices. Place stems in a small bowl. 2. Bring vinegar to a boil in a small saucepan. Stir in sugar or honey, salt, pepper, and thyme; pour over stems. 3. Let stand at least 20 minutes. Yields ½ cup.